I feel spoiled rotten. Really. Do you all know Rohnda? She’s the incredible food photographer behind the Trim Healthy Mama Cookbook and Trim Healthy Table! All those gorgeous photos? She took ’em all. And do you know what she’s done with equal impressiveness? Create Trim Healthy Mama-friendly recipes. You’ve probably made Rohnda’s Ranch Dressing from the first cookbook – that’s her genius. And so are these: Rohnda’s Lemon Poppy Seed Muffins. Rohnda is shutting down her blog, simplifying her life, and out of the kindness of her heart, she parted her treasured recipes between several Trim Healthy Mama bloggers so the whole THM community could still have access to them. I am the lucky recipient of Rohnda’s Lemon Poppy Seed Muffins! I am not kidding when I say the Rohnda’s Lemon Poppy Seed Muffins are the best THM-friendly muffins I have ever had. Oh yes, I love my Pumpkin Muffins with Maple Whipped Cream Topping, my Zucchini Cinnamon Muffins, and my Cinnamon Roll Muffin in A Mug, but these… Wow! I had one warm, straight from the oven, and it was amazing! No need to wait until the next day to enjoy them. No aftertaste or cooling effect. Just a tender, lemon-y, low-carb, gluten-free muffin that doesn’t even contain any dairy (unless you make the glaze, which is totally optional)! 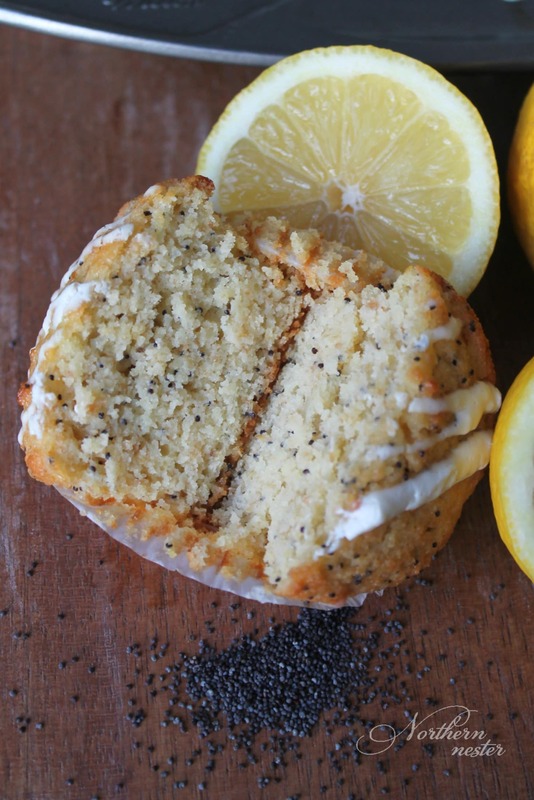 I hope you’ll give Rohnda’s Lemon Poppy Seed Muffins a try. You don’t even need any special ingredients to whip them up! 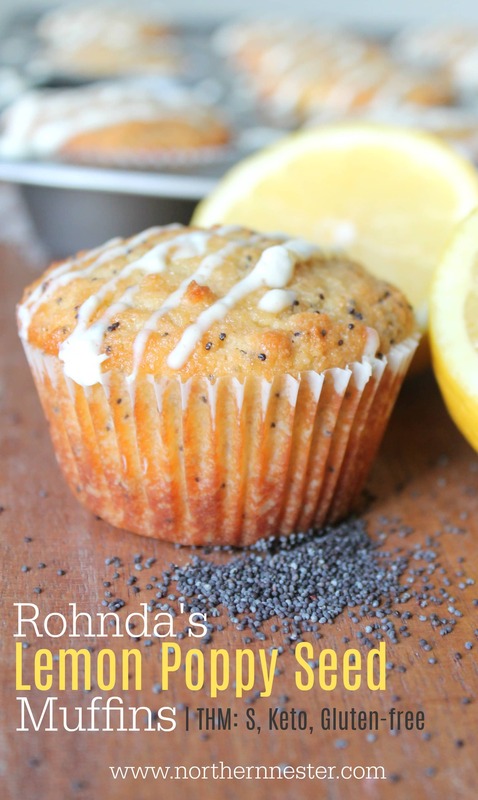 Rohnda's Lemon Poppy Seed Muffins are the best Trim Healthy Mama-friendly muffins I've ever had! An S muffin without any special ingredients, these will be a staple in your home. Preheat oven to 350 F. Line 12-cup muffin tin with parchment liners. Blend together eggs, 3/4 cup xylitol (or use half the amount in Gentle Sweet), lemon zest, lemon juice, lemon extract, and melted coconut oil until smooth. In a separate bowl, stir almond flour, flax meal, coconut flour, baking powder, and salt together. Add dry ingredients to wet and blend just until fully mixed. Stir in poppy seeds. Pour into 12 paper lined or greased muffin tins. Bake at 350F for 30 minutes. To make the glaze, heat cream cheese enough to soften. Add the rest of the glaze ingredients and whip until smooth. Put in a zip-lock back and snip one corner to “drizzle” over warm muffins. Don't care for poppy seeds? Just leave 'em out! Looking for more lemony Trim Healthy Mama eats? These are my other favorites! How would you substitute thm baking blend? Looking forward to making these. Hi Karen, I’ve never made this with Baking Blend, as I try to keep my recipes free from special ingredients, but I think you could use 1 1/2 cups of it. Can i use erythritol in place of the xylitol? If so would the measurements be the same? Hi Andrea! If you’re using straight erythritol, you will need more of it than xylitol, since it’s not quite as sweet. Thanks for this yummy recipe! Could you …or anyone else tell me who got Rohnda’s Coffee Cake recipe? And the single serve version that was on Facebook? It was a favorite of mine but I sadly never printed it. Do you know who got Rohnda’s Sweet Curry Chicken recipe? I would love to make it again! Can gentle sweet replace xylitol?